Sam Butler wheels away after scoring the opener. Eastleigh’s final home game of the season saw the Spitfires take on Bishops Stortford in their penultimate fixture of the campaign. Eastleigh were looking for their third successive win after victories over Welling and Dorchester in the past week. Manager Ian Baird looked to give some of the clubs youngsters a taste of Blue Square South football by handing young goalkeeper Fred Toomer his first team debut to start in place of Jason Matthews. Eastleigh also named reserve striker Alex Easton in the starting eleven who played alongside Richard Gillespie in attack. Meanwhile Eastleigh’s England Colleges defender Lewis Robinson was named on the bench and was later introduced for his debut. Ashley Nicholls came into the starting line up to play at right back in place of the not fully fit Danny Smith. The game came to life in the sixth minute when the lively Tony Taggart threaded a perfect through ball for Richard Gillespie to run on to. The former Bashley hot-shot beat the offside trap and found himself in a great position to open the scoring but fired straight at the keeper. It was a very good early chance for the Spitfires which fell to the man they would have wanted it to, but credit to the keeper Nicky Morgan (who played for Eastleigh briefly last season) for getting down low to make a vital stop. Taggart wriggled his way down the right to squeeze into the area but his shot from the right was from a far too tight angle to trouble Morgan at his near post. In the 20th minute, Stortford had a decent chance from a corner kick. Centre back Lynvall Duncan found space at the far post but from his free header, fired narrowly wide of goal. Four minutes later, Alex Easton pressured the visiting back line into a mistake by closing down well to win the ball high up in the park and in a dangerous position. Having done the hard work in his approach, the youngster had time and space to shoot but had his shot turned away for a corner. Just short of half an hour played, Ritchie Jones was played in to the right side of the Eastleigh penalty box. The full back’s first time shot was only a whisker a way from finding the top left hand corner. In the 38th minute, Eastleigh had a shout for a penalty kick turned down when Sam Butler’s ball into Gillespie saw Duncan bring the Spitfires striker down. Referee Iain Parsons from Salisbury was uninterested and deemed there to be no foul. Coming close through Gillespie, Easton and Taggart, the hosts finally broke the deadlock in the 43rd minute. Alex Easton chased down a lost cause to win the ball and catch Morgan off his line. The youngster spotted the opportunity to chip the keeper and had his fine effort stopped tamely on the goal line by a covering defender. SAM BUTLER followed in well to smash the ball home from close range and give his side a well deserved lead at the break with the opening goal of the game in the 43rd minute. On the stroke of half time, Taggart went on a dazzling run by skipping past defenders and into the box to the left of goal. Just when it opened up for the winger in a promising position it turned out Tony had taken the ball just a little too far in the end as Stortford cleared their lines. Sam Butler’s close range strike following Alex Easton’s hard work and chip proved to be the difference at the half way stage. Eastleigh started the second half the better side and came extremely close to doubling their lead in the 52nd minute. Sam Butler’s exquisite free kick was curling into the corner of goal and would have been his second of the afternoon were it not for a diving save by Morgan. The extremely tall keeper was tested to the maximum as his starting position was from the far post where he then had to launch himself in the opposite direction at full stretch to push the ball on to the post and deny Butler. A couple of minutes later a flicked shot by Stortford’s Reece Prestedge with the outside of his boot provided Freddie Toomer with his first save of the game. The young keeper positioned himself well to cover the shot at his near post enabling him to make a comfortable catch. Lewis Robinson made his first team debut with his introduction coming on the hour mark as Ashley Nicholls made way. The youthful England College’s right back had 30 minutes to impress and looked solid in the time he was given. Eastleigh conjured up a good chance with a fine passing move in the 61st minute involving Taggart and an excellent touch by Easton to play the ball into Anthony Riviere. The tireless midfielder rounded off with a confident finish from 18 yards to find the net, but the flag went up for what must have been a very tight offside decision to rule out the ‘goal’. Anthony Riviere was the next to threaten again for the home side, forcing Nicky Morgan into another smart save as the midfielder unleashed a powerful volley from just outside the box on 66 minutes. The keeper had to be on his guard to make a top reaction save by tipping the ball around the post for a corner kick. From the resulting set piece, Richard Gillespie met Butler’s delivery with a bullet header straight into the gloves of Morgan. Tom Jordan and Ross Bottomley were very solid at the heart of the Eastleigh defence winning all of the headers and important tackles to keep Bishops Stortford at bay for long periods of the game. The closest Mark Simpson’s side came to a break through was when Charlie Simpson’s cross from the left in the 74th minute found Duane Jackman closing in on Toomer only to find Eastleigh skipper Jordan applying the pressure to force the effort a good five yards off target. At the opposite end Eastleigh went back on to the front foot with Richard Gillespie having an ever better chance to find that elusive second goal for the hosts. Tony Taggart’s lofted cross was inch-perfect to find Gillespie, who peeled away from his marker to find time and space at the back post but nod wide of the goal. On 78 minutes, Eastleigh forced successive corners and from one of them saw a Tom Jordan header blocked on its way to goal from a Sam Butler delivery. The Spitfires had a final chance to find a second goal and possibly claim three points when Riviere’s splendid pass down the right saw substitute Shaun McAuley race clear of the Stortford defence. Having done the hard work, McAuley could only manage a tame strike straight into the midriff of goalkeeper Nicky Morgan, who saved comfortably at his near post. Stortford improved in the closing stages and could have drawn level through Danny Morgan’s free header seven minutes from time following a great cross from the right. DANNY MORGAN made amends by finding the back of the net in the closing minutes, poking the ball through the legs of Fred Toomer who had raced a long way off his line to try and avert the danger caused by his defence playing the striker on side. 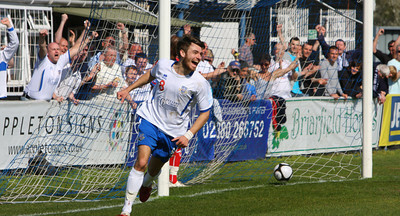 After Stortford had forced an equaliser four minutes from time, Eastleigh had a couple of half chances with Richard Gillespie firing a half volley from a tight angle wide of goal and then moments later in the closing stages the same player failed to trouble Morgan with a header from a Peter Adeniyi cross. The game finished 1-1 which perhaps wasn’t quite a fair reflection of the game given the number of chances that came and went for Eastleigh. The Spitfires conclude their season away to Worcester City next Saturday. Special thanks to Jamie Montigue, Graeme Horobin and Radio Spitfire for their coverage of Eastleigh FC home games. ‘Amateur’ sports journalism is made by fans, for fans.